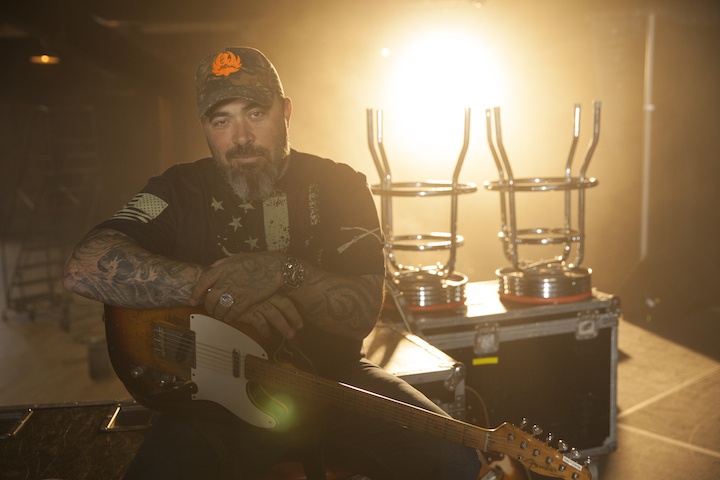 If it sounds like Aaron Lewis is long past defending his Country music pedigree, that would be a correct assessment. Lewis would prefer the music speak for itself and, with the release of SINNER, Lewis’ stunning Dot Records follow-up to his groundbreaking full-length solo debut The Road in 2012, any would-be detractors will be pretty much out of ammo. Lewis, however, is not. Lewis admits he “didn’t really pay attention to any of the Country music in between” that early Outlaw exposure and his emergence as a new voice for the genre with the release of “Country Boy” on the Town Line EP in 2011. “I was too busy going down the road of one day ending up being in a rock band, and revolting against the music I was basically force-fed as a kid,” he says. “I finally came around full circle, and this music crept back into my life. My plumber at the time bet me that I wouldn’t write a Country song, so I sat down and wrote ‘Country Boy,’ and the rest is history.” As the front man for one of modern rock’s most successful bands in Staind, Lewis admits his entre into the Country world has been met with mixed reactions. “I have definitely dealt with some of the old guard questioning my commitment to the genre, questioning how much of this might be a toe-dipping in the water to see what the temperature is,” he says. “I had, and still have, a very established career in the rock world, and as much as that has been a blessing in some ways, it has been a curse in others in trying to be looked at as somebody who is taking this seriously and isn’t just trying to go where the money is. Few pop-tinged songs would dare feature lyrics as candid, biting and personal as those on SINNER. The 11 songs on SINNER herald a man who admits—and often deeply regrets—his personal shortcomings, yet offers no excuses. “This is an album of acknowledgement, admittance, moments of self-awareness,” he says. “It has been a pretty trying time in my life over the past few years, and these songs are what have come of it. At the risk of sounding cliché, my music has always been therapeutic for me.” SINNER captures what was going on in Lewis’ head at this point in his life; laid back with a soundtrack that harkens back to the Country genre’s most honest and musically adventurous artists. I was able to write and record a record that I was responsible for how it came out.” Written on tour and during infrequent down times over the past two years, and road-tested in front of fans that basically served as judge and jury for inclusion on the record, the songs on SINNER together alternate between swagger and vulnerability, biting humor and fierce independence. Most of the songs were cut live in the studio, using scratch vocals. “I had a pretty good idea what I wanted the album to sound like,” says Lewis, “and then it was a matter of just going in and either playing songs for the guys in the studio live on an acoustic guitar and let them go from there; or playing them YouTube clips of the song live off of somebody’s phone. « An Irish Christmas – w/Ticket Promotion!